We play friendly games on every Sunday between the start of May and the middle of July (not bank holiday weekends) and every Sunday in September. We do not charge an annual membership, only £8 a game for adults, £4 for youths, if you would like to come down and try us out, for your first game we would only asks £4 to cover the cost of the Tea. Contact Malcolm for details on 621225 or redcapclayton@btinternet.com . Read about how the club was founded in the early 20th Century. 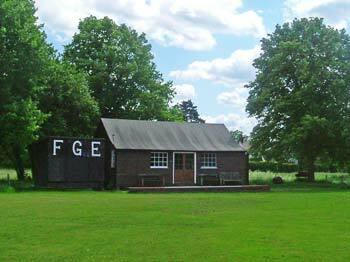 The club held it's Annual General Meeting on 14th February at the village hall. The chairman reported that the club had played 14 games in 2017, losing 6, drawing 1 and winning 7. The highlight of the year was the Corfu tour. All those who did teas and the all committee members who had a busy year what with the issue of the bylaws and who owns the pavilion were thanked. It was remarked that due to the form filling skills of Gary Bennett the club will be getting a grant of £1000 from the Abinger parish council and we are in the process of reapplying for a grant from Ride London. Luke was thanked for his help with running the bar. John Ball the treasurer, reported the club had made a loss of £317.87 this would have be more if we had not had a donation of £700 from the village day and £500 from the Forest Green bonfire. Part of the reason for the loss was that we had a lot work done on the square at the end of the season, we hope the APC grant will pay for this work. The second report of the evening from the fixture secretary was to say that a game is planed for every Sunday between the 6th May and the 23rd September except 8th July which is village day in 2018. There was a long discussion on whether we should have another tour to Corfu. It was decided that there were not enough FG players available to run it this year and that we should plan to go again in 2019. A date to be set for the tour and a list of those interested to be compiled later this summer. After many years involved in generously supporting Forest Green CC, Richard Keen was elected as Club Patron. All the other club officers and committee members were re-elected. The evening closed with hot pancakes freshly cooked by Di Cuthbert.